Trinity Financial and Codman Square NDC are partners in proposal to build 3 residential buildings on what is now a parking lot next to Mattapan Square station. This rendering shows the view from River Street. The MBTA is reviewing a pair of competing proposals that would transform a sleepy parking lot next to the Mattapan Square trolley and bus station into a bustling mix of rental housing, condos, and ground-level retail. The rival plans will seek to win community and political support in the coming weeks, but either one would bring a much-needed infusion of affordable housing, jobs, and investment to the city’s southern gateway. The bids were submitted last week in response to a Request for Proposals issued last fall by a realtor representing the MBTA. Two earlier attempts to market the nearly 2.5 acre site off River Street either generated little interest or were upended by a slumping economy. Mattapan Sq. proposal: A view from above shows where the Nuestra-POAH proposal would position two new residential buildings next to Mattapan Sq. station. Now, seizing on a red-hot regional housing market, the MBTA hopes to generate income for its own coffers (the minimum asking price for the site is $1.5 million; the T has not disclosed how much each party has bid) while responding to the community’s interest in spurring redevelopment in the heart of Mattapan. While the proposals vary in size and density, the development teams are similar in that both have extensive experience in redeveloping successful mixed-income housing near transit hubs in the city of Boston. 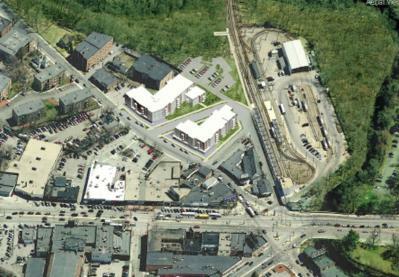 The first team includes Trinity Financial, a private development firm that has a long and successful track record in Dorchester and Mattapan— including the redevelopment of the former Chronic Disease Hospital along River Street, which Trinity re-invented as a mixed-income housing and assisted community over the last decade. In this venture, Trinity has teamed up with Codman Square Neighborhood Development Corp. (NDC). The Trinity-Codman proposal includes more housing units – 267 in total – in a three-building complex that includes a 4,500 square-foot retail space along River Street. The largest of the three buildings would include 94 units, of which 20 percent would be priced at market rate and the rest subsidized through a low-income tax credit, allowing for affordability. A second 94-unit apartment building – with 100 percent affordable units – would be built across a new city street that is laid out in both proposals, allowing for access for parking for both residents and commuters. 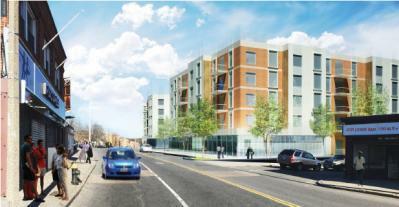 A third building with 47 units situated closer to the trolley tracks and a connection to the Neponset Greenway trail would be marketed as condominiums under the Trinity-Codman plan. A proposal led by Boston-based Preservation of Affordable Housing Inc. (POAH) and backed by Roxbury’s Nuestra Comunidad Development Corporation offers fewer housing units than the Trinity-Codman plan, but more than doubles the retail component along River Street, with an estimated 10,000 square feet of commercial space. The 135 units of housing would include a mix of apartments and condos in two buildings. Fifty-two percent of the units would be marketed as “affordable,” targeting residents who are 60 percent of Area Median Income (AMI) or lower. Nuestra-POAH proposal— a view from River StreetNuestra Comunidad would bring solid experience to the job of working to re-use former MBTA land. The non-profit development corporation is now working to redevelop the former Bartlett bus yard near Dudley Square in Roxbury, a $170 million effort that will eventually house 323 units of housing and more than 52,000 square feet of commercial space, along with a charter school. 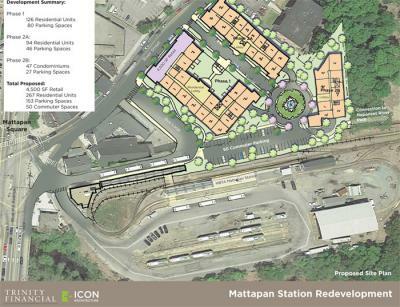 Rodger Brown Jr., POAH’s managing director for real estate, said that even if the Mattapan trolley line were to be replaced or removed, the site would still be a viable place for redevelopment. Price said that the housing units would be predominantly rental, but would include some condos as well. “We’ve left it open to how extensive that will be,” said Price, who noted that Nuestra has already convened one “charette” to solicit community input, a meeting held last fall at the Mattapan library. Both teams say they expect to present their plans to the community for closer review and feedback in the coming weeks. An internal review of the two proposals “has just started,” according to MBTA spokesman Joe Pesaturo. "The MBTA is reviewing the proposals and asking the bidders some follow up questions," Pesaturo said. "Also, the T will enter into a consultation process with the City. Per the T's commitment, the designated developer will make a presentation to the community regarding their proposed project."